Alan Tudyk is considered a good luck charm to Walt Disney Studios, having appeared and voiced multiple characters in different Disney properties from Walt Disney Animation Studios, Pixar, and Lucasfilm. Now the actor will be taking his voice talents to a different part of Disney, their live-action department. According to new reports, Tudyk will be voicing Iago in director Guy Ritchie‘s live-action adaptation of Aladdin. More on the report below. 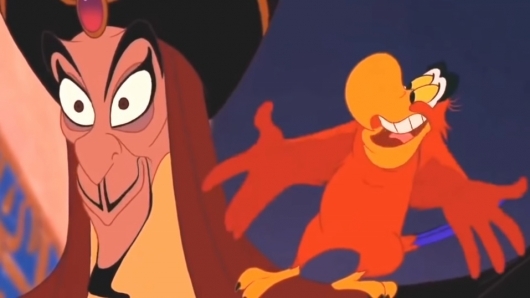 Trailers for Disney’s live-action adaptation of Aladdin have been relying on old familiar themes and elements from the animated original. At the same time, there needed to be some new additions to generate a new wave of fans who may have never seen the Ron Clements‎ and ‎John Musker-directed original or just may not have been around to see it. While that may have worked for some, a brand new trailer gives us a better sense of the size and scope of the live-action remake while also bringing back some of the more memorable scenes from the 1992 film. Check it out below. This year, Disney will be taking us to a whole new world of their live-action adaptations of their animated classics. Following up the success of such films like The Jungle Book and Beauty and The Beast, the studio will be releasing Aladdin. Expectations are riding high for this one as it is a widely beloved title and all eyes will be on Will Smith, who plays the role of Genie, who was voiced by the late Robin Williams in the original. During the Grammy Awards broadcast on Sunday night, Disney unveiled another look at the live-action Aladdin, which reveals our first look at Smith’s genie. Watch it here below. 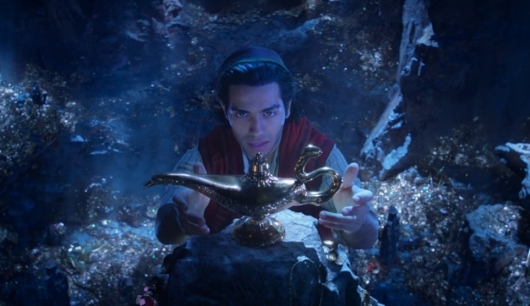 It’s been weeks since we saw the teaser trailer for Disney’s live-action adaptation of their animated classic, Aladdin. 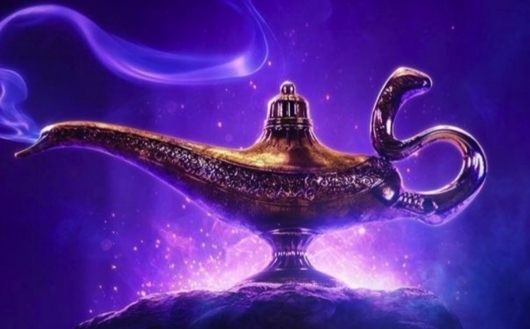 Based on the Middle Eastern folktale collection “One Thousand and One Nights,” the film will see a street rat named Aladdin (Mena Massoud) finding an all-powerful magical lamp that holds a wish-granting Genie (Will Smith). Using its power, he’ll disguise himself as a prince in order to impress Princess Jasmine (Naomi Scott). 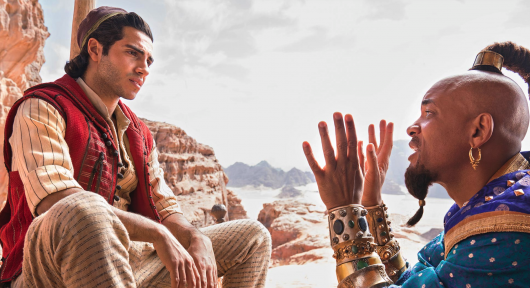 The film isn’t due out in theaters until next year, but a handful of new images have been released that give us our first looks at Princess Jasmine, Jafar (Marwan Kenzari), and, of course, Genie. Check these images out, plus a few tidbits on the film from the cast and director Guy Ritchie, below. Walt Disney Studios has released the first teaser trailer for their live-action remake of Aladdin. This follows the release of the teaser poster we saw this week. The trailer is most definitely a teaser, not showing much at all. But we do get some familiar things in live-action (and sometimes CG) form, set to some familiar music. You can read more about the new Aladdin and check out the first trailer below. Disney remaking their animated film Aladdin was highly inevitable. The film surely has its fan base like any other. And just like the remakes that came before it, they have been eagerly awaiting to see what the film will look like. Well, it’s far from a first look at the entire cast, but Disney has released the first teaser poster for the live-action remake of Aladdin. And as you might expect, rubbing on it may make your wishes come true. Check out the teaser poster below. 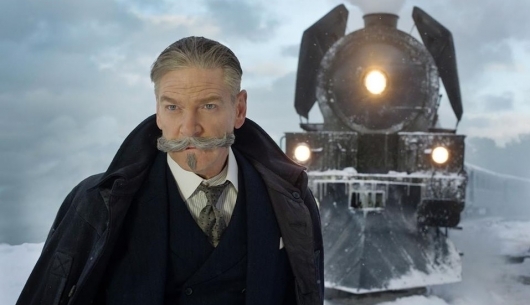 A second trailer has been released for Murder on the Orient Express, the latest adaptation of the 1934 Agatha Christie novel of the same name directed by and starring Kenneth Branagh as renowned fictional detective Hercule Poirot. Also starring alongside Branagh is Daisy Ridley, Josh Gad, Tom Bateman, Penélope Cruz, Willem Dafoe, Judi Dench, Johnny Depp, Derek Jacobi, Leslie Odom Jr., Michelle Pfeiffer, Marwan Kenzari, Olivia Colman, Lucy Boynton, Manuel Garcia-Rulfo, and Sergei Polunin. Continue below for a little more info on the movie and to watch the new trailer. 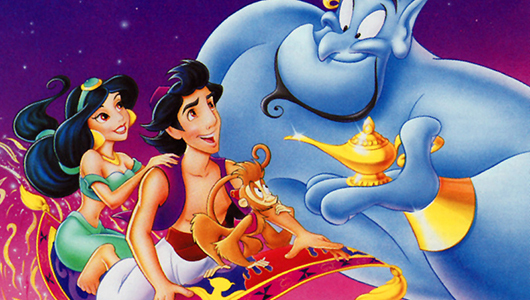 Today marks the start of production for Disney’s latest live-action flick, Aladdin. The film stars Mena Massoud as the title character who falls in love with the Sultan’s daughter, Princess Jasmine (Naomi Scott). 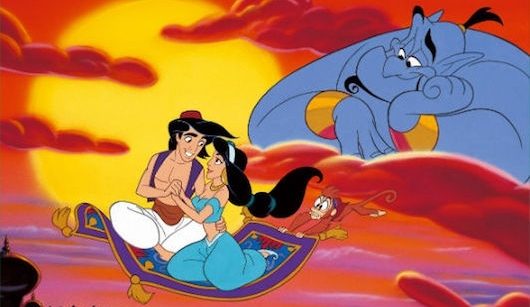 As with nearly all the live-action adaptations that Disney has released so far, you can expect Aladdin to stay true to the spirit of the animated original while also adding in a few contemporary elements so that it can connect to a new audience. 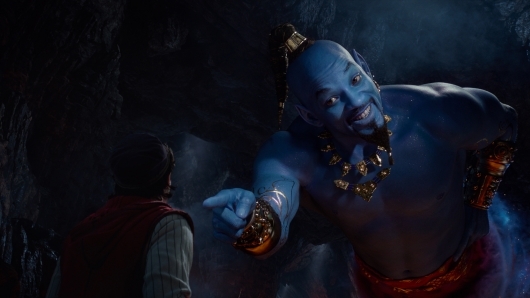 One of those elements is Will Smith, who will play the iconic Genie, a magical being who grants Aladdin three wishes after he frees him from his lamp imprisonment. Now with production in full swing, Smith has released a brand new photo of himself, Massoud, Scott, and Marwan Kenzari who’s playing Jafar. Check out the image below. Though it is still in the very early days of development, Guy Ritchie‘s adaptation of Walt Disney’s animated hit, Aladdin, is coming along very nicely. While at the D23 Expo, it was announced that Egypt-born, Canada-raised Mena Massoud, and Power Rangers star Naomi Scott, would play Aladdin and Princess Jasmine, respectively. Will Smith, who was previously reported to be in talks to voice Genie, would also be confirmed for the cast. Now the cast grows by adding two new actors. 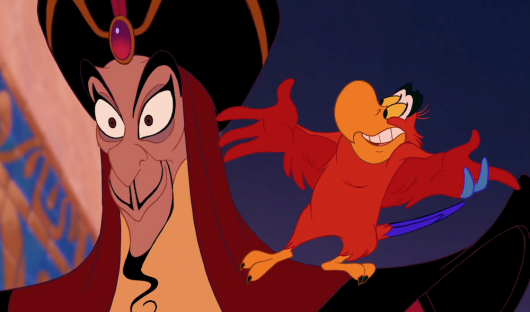 Dutch-Tunisian actor Marwan Kenzari is in talks to play Jafar, the scheming advisor to the Sultan, and SNL‘s Nasim Pedrad will join the cast as a new character created for the film. More on the story below. In between Josh Gad trying to get answers to all of the big Star Wars: The Last Jedi questions from co-star Daisy Ridley, a new Murder on the Orient Express movie was made. 20th Century Fox has released an official trailer for the movie, which is directed by and stars Kenneth Branagh. He’s joined by an impressive cast including Ridley, Gad, Tom Bateman, Penélope Cruz, Willem Dafoe, Judi Dench, Johnny Depp, Derek Jacobi, Leslie Odom, Jr., Michelle Pfeiffer, Marwan Kenzari, Olivia Colman, Lucy Boynton, Manuel Garcia-Rulfo, and Sergei Polunin. 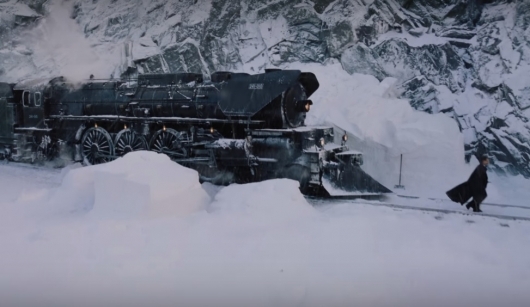 Continue below for a brief description of Murder on the Orient Express and to check out the official trailer and a poster.